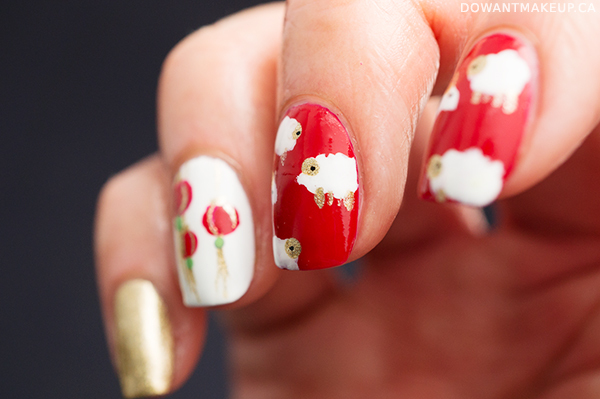 I wasn't really planning to do a nail post for Chinese New Year but then I remembered, SHEEP. They are so cute and fluffy. 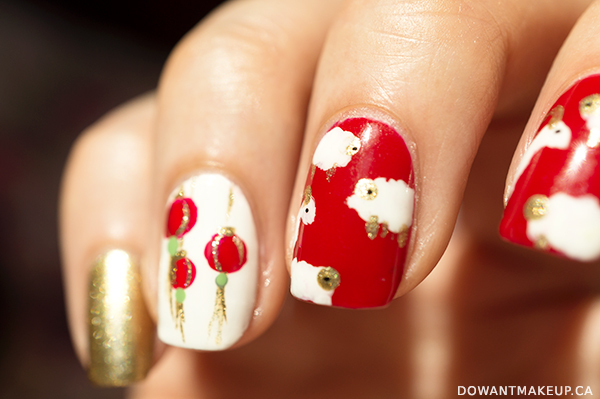 So yes, I have a Chinese New Year nail art post for you. Red and gold together are terribly tacky to me any other time of the year except CNY--everything is red and gold. Orly Luxe, a gold foil that shows few brush strokes, and butter London Pillar Box Red, a deep, bright red, fit the bill perfectly. 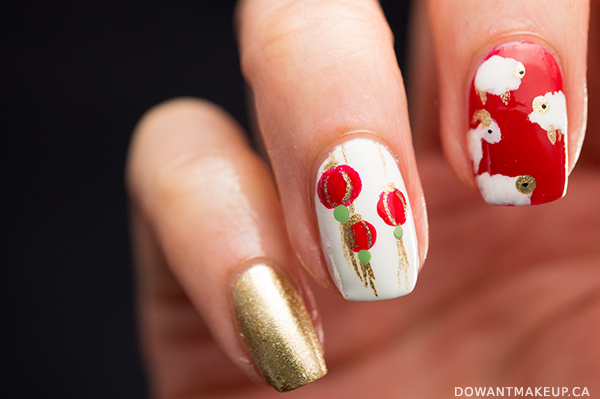 I used Orly Luxe for the little finger and all the little gold details on the other nails. Pillar Box Red is the base for the middle and index fingers, as well as the lanterns on the ring finger. I used Mineral Fusion River Rock for the green details on the lanterns, but decided it leaned too grey brown and went over it with Clinique Hula Skirt. 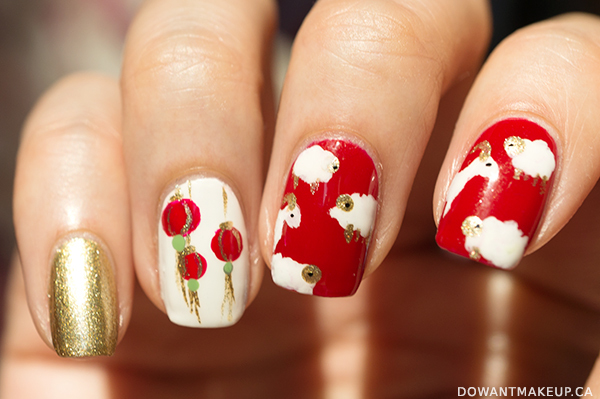 I used OPI Alpine Snow as the base for the ring finger and to draw in my sheep and goats. There is some confusion as to whether it's the year of the sheep or the goat; it could be one or the other depending on the country/region. Goats are kinda cool I guess, so I worked them in with the sheep as well. (The sheep were more fun to draw though.) I got the idea to draw the sheep in this way, peeking out from the edges, from this Instagram account. 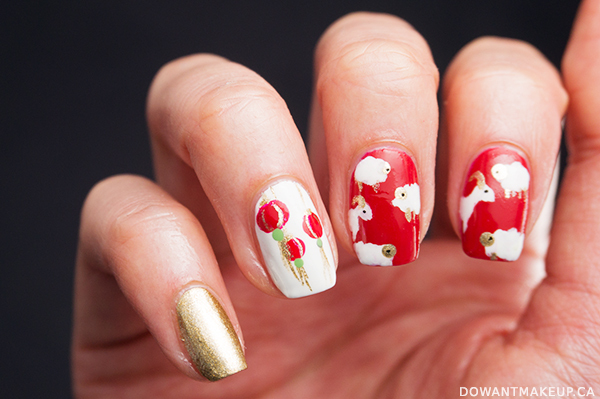 which you should totally follow if you love detailed nail art. I know the nail in focus here is the lanterns but holy, Orly Luxe looks good in macro!